For almost 40 years, U92 WWVU-FM has been the home of new music and broadcaster development at West Virginia University. Now, we need a new home. We've outgrown our Mountainlair studio, and we need new equipment to keep our students competitive as they prepare for careers in broadcasting. That's why we're launching a crowdfunding drive for the first round of funding needed for this ambitious project. Since its inception in 1982, U92 has drawn students who love music, broadcasting and the large and welcoming community that thrives at the station. Housed in a back hallway of the Mountainlair, the 2600-watt, 24/7 station is totally student-run and is at 91.7 FM and online. Over the years the station has helped launch the careers of a number of alumni who have worked in media. But the station has played an equally important role in the lives of thousands of Mountaineers who view U92 and the friends made there the best part of their college experience at WVU. The station has outgrown its facilities that are cramped, worn and in desperate need of upgrades. For example, tiny studio A, the main broadcast studio where students hone their skills in broadcasting, still has an analog console, while the industry standard is now digital. By moving, enlarging and updating equipment to that is used in commercial stations, we have the opportunity to make the station and the student experience world class. We're not just building a new studio- we're creating a cohesive work space for all of Student Media, that will promote collaboration, innovation and efficiency. U92 will move from its current home to the Daily Athenaeum building, a two-story building located a block and a half behind the Mountainlair. There, U92 would occupy 1,645 sq ft of the first floor, and include three studios, two staff offices, six bar level work spaces, a large communal space with couches and chairs, a conference room and kitchen. 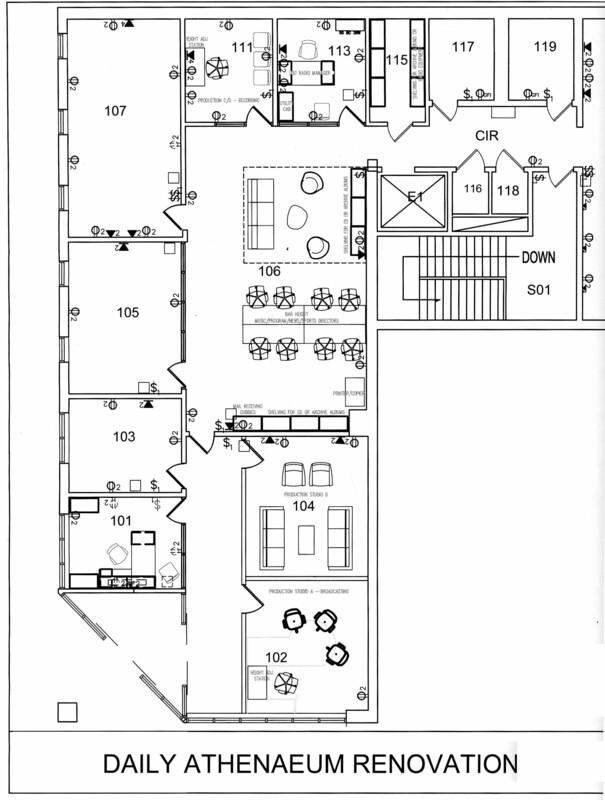 Studio A, the main broadcast studio (14’ by 12’.11”), would include large exterior windows facing Prospect Street, allowing pedestrians a view (and sound from an outside speaker) of the U92 DJ's at work. Studio B, behind that booth and slightly larger (14’.9” by 12’.11”) would have portable furniture that would allow multiple uses including talk shows and even musical acts. Along with this new space, U92 will have state-of-the-art broadcast equipment, newly-renovated workspace, and a secure stand-alone building with 24 hour security and lighted parking lot. By bringing U92 into the Daily Athenaeum building, the radio station will be united with the DA, WVU's independent student newspaper. Both U92 and the DA will retain their individual organizations, as well as benefit from shared resources, professional staff and digital innovation. Students will have the opportunity to work together to cover news, sports, and more, use social media and websites to inform their audiences and share skills across broadcast and print media. Plus, with the proximity of the two staffs, it is likely more students at U92 would can learn the varied skills needed to broadcast, podcast and edit audio. This will allow WVU graduates a broader skill set when they seek jobs and internships. Advertising and PR opportunities will also expand as the DA advertising and marketing staff of close to a dozen students will have the opportunity to work with U92 to sell advertising on its web site, as well as on-air sponsorships and marketing opportunities that could generate additional revenue for the station. Crowdfunding for the #NewU92 project runs from April 15-May 31, 2019. Check out the ways you can be a hero and Help Build a New U.
Crowdfunding Will Run April 15 through May 31, 2019. Thanks for your Support!